Cheshire West and Chester Council is supporting this year's Clean Air Day on 21 June by providing free Park & Ride travel in Chester. Clean Air Day organisers ask us all to do our bit to clean up the air around us on the longest day of the year. The Council's Park & Ride service uses buses with more environmentally friendly 'enviro-clear' engine technology. The Council's Cabinet Member for Environment, Councillor Karen Shore said: "There are lots of simple things we can all do to improve air quality and look after our own and other people's health. "Clean Air Day is a chance to find out more about air pollution, share information with friends and colleagues, and help make the air cleaner and healthier for everyone. So, on 21 June leave the car at home - walk, cycle or take public transport instead. "If you're travelling in Chester, Clean Air Day is an ideal opportunity to try the Park & Ride for free if you’ve never given it a go before." 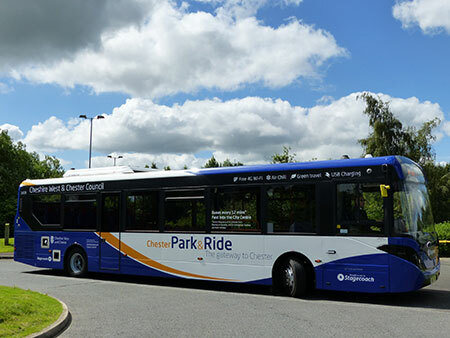 Park & Ride locations, routes, and timetables can be found on the Council's website. Try ways to use the car less. If you have children at school, talk to other parents at your child’s school to make a better school run. Car sharing or a walking bus often reduces traffic at the school gate by 30 per cent - a sure fire way to make the air cleaner for children. With cars, vans and lorries responsible for so much air pollution, low-emission electric vehicles (EVs) are the future - and their costs over a lifetime are cheaper than you might think. So when you upgrade your car, explore an electric, hybrid or Liquid Petroleum Gas (LPG) model (to save on your road tax too). If you have to drive, avoid engine idling. Turning a vehicle’s engine off while stationary protects the health of people in the car behind and on the pavement. Wood-burning stoves look great and they’re so cosy but burning wood produces a lot of air pollutants. To minimise your contribution to air pollution buy a Defra-approved stove, use authorised fuel, and only light it when you really have to. Clean Air Day is organised by the national charity, Global Action Plan. Their website has a wide range of resources and toolkits to help communities, schools and workplaces to improve air quality. To follow on from Clean Air Day, Council Environmental Health officers are working with Global Action Plan to organise an electric vehicle information event in the borough. The event will be held in front of Chester Town Hall on Wednesday, 25 July 2018. There will be a range of electric vehicles on display, experts on hand to answer questions and the opportunity to book test drives. The Council's Low Emission Strategy, to tackle air pollution in the borough, is currently being finalised following a recent public consultation and will be launched in the autumn. It includes details of the Council's plans to install charging points for electric vehicles across the borough to encourage the use of low emission vehicles.